So, you're in the market for a new professional-grade guitar, that offers a great combination of tone and style? Then you need to get out th.. So, you're in the market for a new professional-grade guitar, that offers a great combination of tone and style? Then you need to get out the G&L CLF Research Skyhawk Guitar in Clear Blue - G&L's latest evolution of the beloved Skyhawk model. 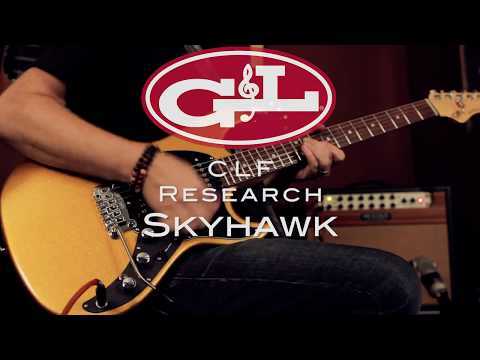 For the new CLF Research Skyhawk guitars, G&L have opted to go back to 1984, when the original Skyhawk was released. These guitars come complete with a comfortably contoured double-cutaway body, with a slim waist, and arched pickguard shape, successfully combining playability with style. On top of this you get a sleek, "Modern Classic" neck, dual fulcrum vibrato bridge, and a set of powerful MFD single coil pickups, resulting in a truly versatile rock and roll machine. Magnetic Field Design (usually shortened to MFD) single coil Ceramic pickups have been specially designed to offer a higher output than a traditional single coil, but without the noise. These pickups also offer a warmer tone than a traditional single coil, with a broader frequency response, and offer individual pole piece adjustment, allowing you to adjust each strings output accordingly.